Beatrice d’Este, Duchess of Milan was the second daughter of Ercole d’Este and his wife, Eleanora of Aragon. Her older sister was named Isabella and her brother was named Alfonso. The Este and Sforza families had always been on friendly terms. 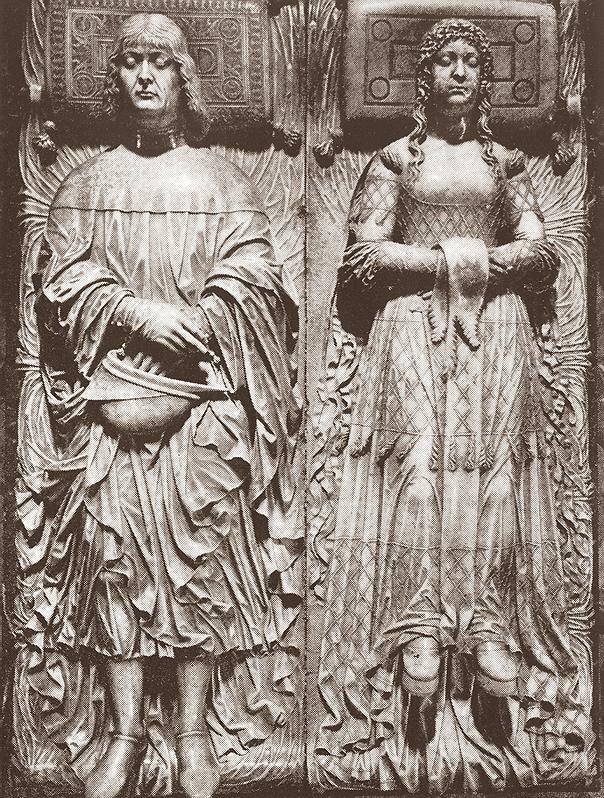 In order to cement an alliance between their two families, Lodovico Sforza formally asked Ercole d'Este to give him the hand of his daughter, Isabella, in marriage. But because Isabella was already betrothed to Francesco Gonzaga, he was offered 15 year old Beatrice’s hand in marriage instead. Ludovico, also known as Il Moro made no objection and he betrothed the lovely Beatrice instead. Originally, Isabella and Beatrice were to marry in a double wedding, but Francesco Gonzaga postponed the wedding several times. The double wedding went ahead, but instead of Isabella and Francesco, the other couple was Beatrice’s brother, Alfonso who married Anna Sforza. 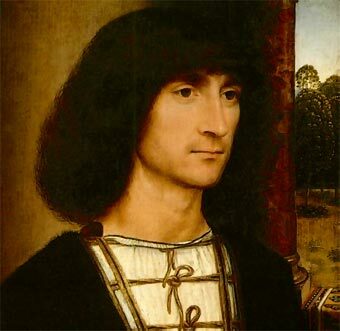 The wedding planner for the elaborate celebrations was Leonardo da Vinci himself, a good friend of the d’Este family. As wife of Lodovico Sforza, Duchess Beatrice reigned for six years over the most splendid and luxurious court in all of Italy. 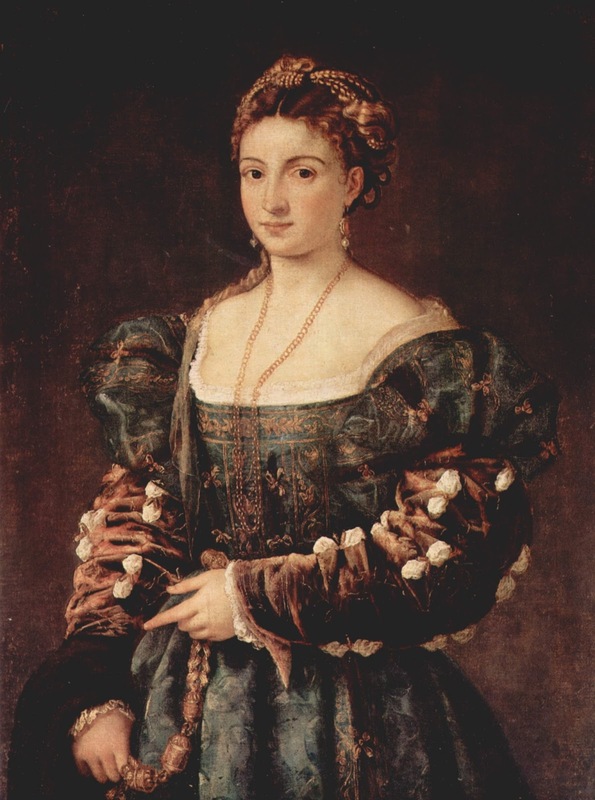 Her charming personality, her love of music and poetry, her exquisite taste in fashion and art, made her one of the most endearing and attractive women of the Renaissance. It is these qualities that catapulted her into the center of Italian political life. The young bride flung herself with passionate delight into every amusement, singing gay songs with her courtiers, dancing and hunting through the day, outstripping all her companions in the chase, and laughing in the face of danger. 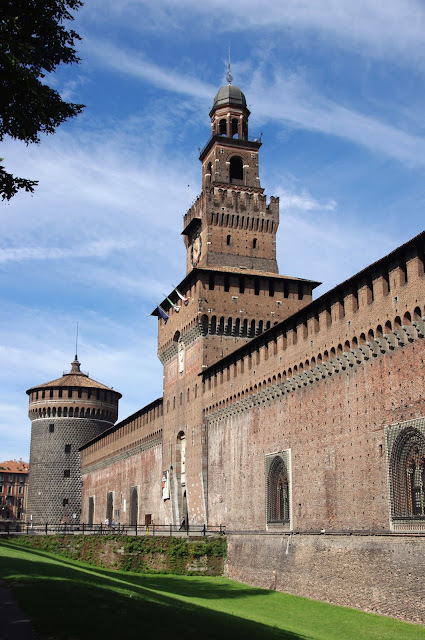 She held her court in the famous Castello of Porta Giovia or in the summer palaces of Vigevano and Cussago, palaces often decorated by Leonardo da Vinci himself. She lived in a time alight with masquerades, sonnets, illuminated books, and beautiful musical instruments like organs and viols. Scholars and poets, painters and writers, gallant soldiers and accomplished cavaliers, all cast themselves at Beatrice’s feet, striving how best they may gratify her fancies and win her smiles. Young and old, they were alike devoted to her service, from Galeazzo di Sanseverino, the valiant captain who became her willing slave and chosen companion, to Niccolo da Correggio, who laid down his pen and sword to design elaborate patterns for his mistress’s new gowns. She and Isabella exchanged many letters, sparkling with wit and gaiety and overflowing with simple and natural affection. The letters are in great detail and depict the highs and lows of her life. At the birth of her first-born son, she rejoiced with proud delight, bragging about his size and growth and first words. She grieved her mother’s loss and was often wounded by her husband’s neglect or unkindness. Beatrice resented wrong and injustice, and in her youth, may not have been careful with the feelings of her rivals. Despite her faults, she was kind, generous, human, and lovable. In 1492 she travelled to Venice as ambassador for her husband who desired to be named duke of Milan in lieu of Gian Galeazzo Sforza. Beautiful and royally arrayed in brocade and jewels, she stood up in the great council hall of Venice, to plead her husband’s cause to be named duke before the Doge and Senate. This usurpation was only legalized when Gian Galeazzo died. 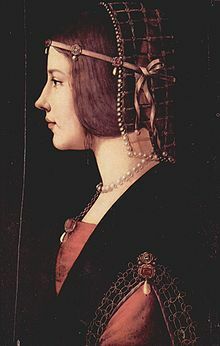 Beatrice participated with her husband in council, received kings and emperors, and captured the heart of Charles VIII. And then suddenly the music and dancing, the feasting and travelling, cease, and the richly coloured and animated pageant is brought to an abrupt close. At the age of 21, Beatrice died in childbirth. In a letter written hours after her death, Ludovico informed his brother-in-law Francesco Gonzaga that his wife, "gave back her spirit to God" half an hour after midnight. Their child had been born at eleven at night and was a stillborn son. Amid the tears and lamentations of all Milan, she was borne to her grave in S. Maria delle Grazie. With her death, the whole Milanese state, that Lodovico Sforza had built up at such infinite cost and pains, crumbled into ruin. Fortune, which till that hour had smiled so kindly on the Lodovico and had raised him to giddy heights of prosperity, now turned her back upon him. In three short years he had lost everything–crown, home, and liberty–and was left to drag out a miserable existence in the dungeons of Berry and Touraine. Romanticised and fantastical account which is loosely threaded with 'facts'. Ludovico was never 'crowned' so could not lose one. This type of 'Mills & Boon' version of history serves no purpose other than to obfuscate the realities of the times. Galeazzo Sanseverino was no-one's 'slave' and you do him a great disservice to describe him as such. It would be more accurate to to describe females of those times as highly valuable exchangeable 'goods', who were used in arranged marriages for financial and status gain. Many were 'disposed' of when they were not of a quality sufficient for those purposes. 'Chattel' is a word that was often used in factual historical definition. could you recommend me where i could find all her letters?